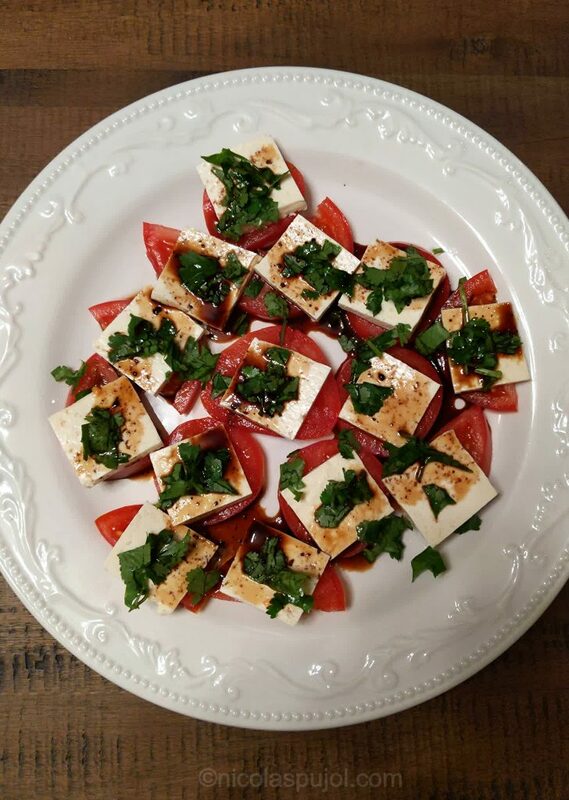 This vegan caprese salad retains the gorgeous colors from the original with a variation using tofu, fresh herbs (basil, parsley or cilantro) and no oil. 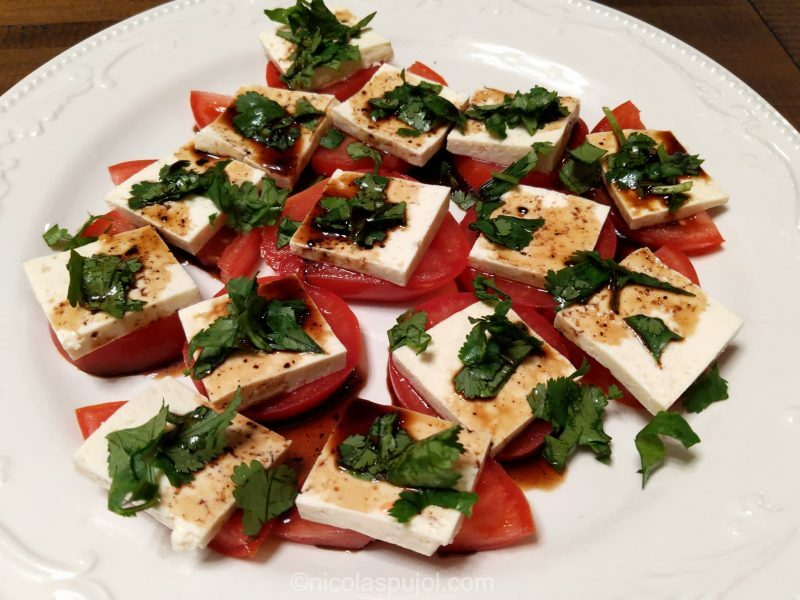 Another variation of a classic: the caprese salad, also known as tomato mozzarella salad. For this recipe, we are taking a vegan set of ingredients, by removing the dairy. We are also removing the classic olive oil from the dish as we often do nowadays. 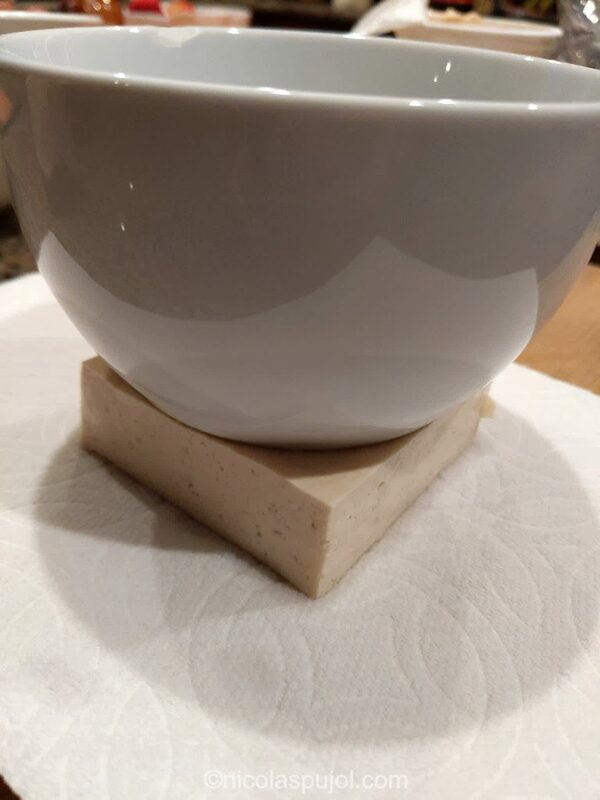 Tofu is pretty simple to use. I usually do not remove the excess water trapped inside when cooking or frying it, as it evaporates. 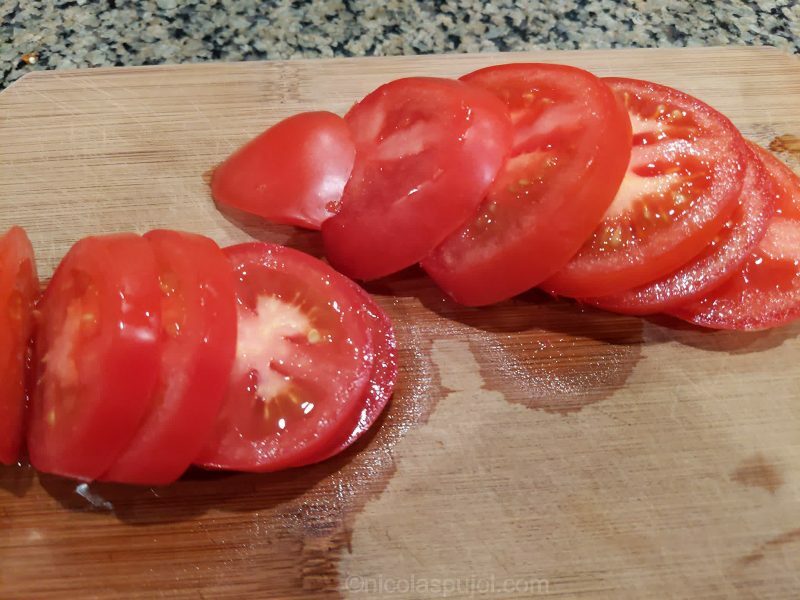 However for a raw salad, you can find a small plate or bowl and put it on top, over a paper towel which will absorb the water. Within 5 minutes, the job is done. There is a belief or an assumption that removing oil from recipes results in a fat-free recipe. This is not exactly correct. Oils are extracted from foods, for example nuts, avocados, olives, etc. If you eat an olive and don’t spread oil on top, you are eating oil-free. However, the olive itself still contains some amount of fat. It is the same fat, but with the rest of the olive nutrients. Dr Esselstyn estimates that removing oils while still eating a balanced whole foods, plant-based diet reaches an average of 11% fat in the total caloric intake. 11% is not 0%, but it’s less than the 30-50% calories coming from fats, common figures in the standard American diet. Because we are using tofu, and the latter tends to come in cubic packaging, the shapes are a little different. 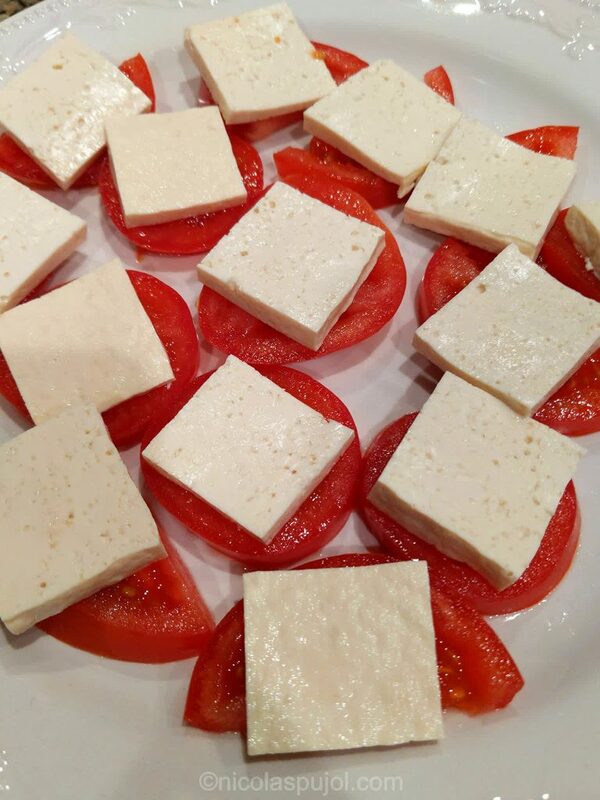 The round mozzarella slices turn into square or rectangular tofu slices. Tomatoes don’t change. In terms of fresh herbs, you can’t go wrong with fresh basil. 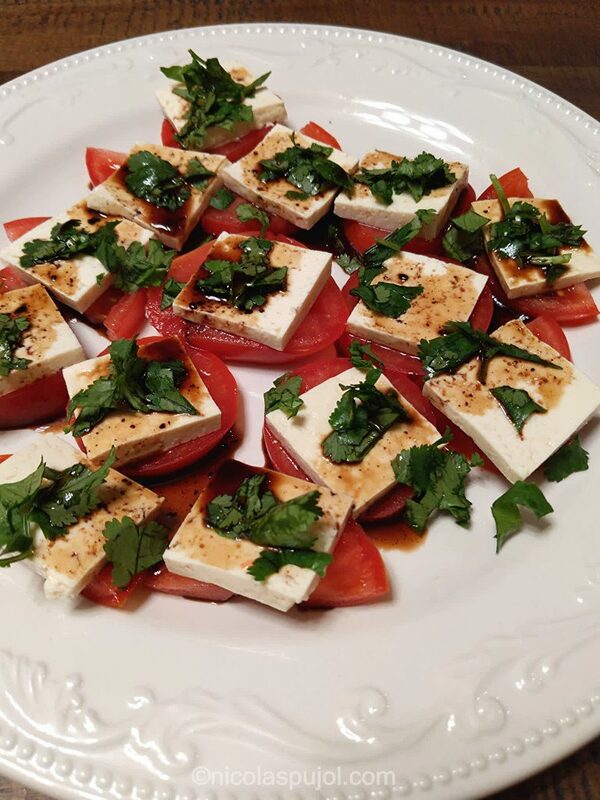 I found that you can also use parsley, or even cilantro, as I did on this recipe. These fresh herbs can be augmented with a little bit of crushed garlic, mixed with the balsamic vinegar. 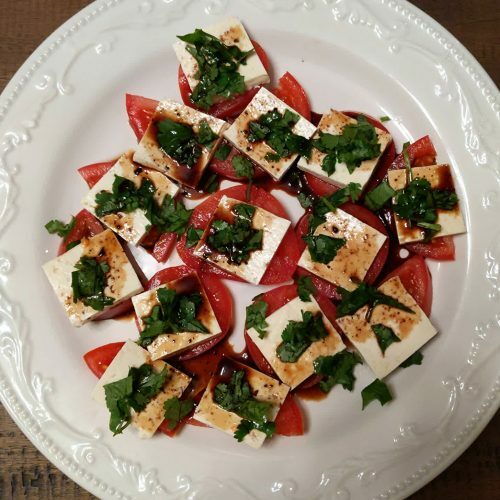 This dish does a great appetizer, and the colors of red, while, green, and contrasting balsamic vinegar on a white plate look gorgeous. 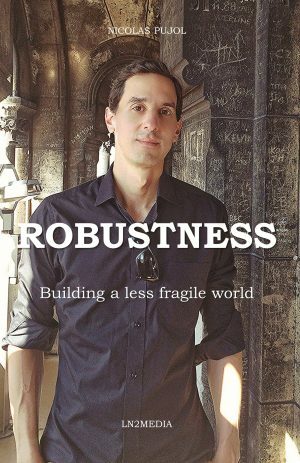 Take the tofu from its packaging. If enclosed in water, place a small plate on top, wrapping it with paper towel, to remove the excess water. Leave for 5 minutes. In the meantime, slice tomatoes and fresh herbs, and make the dressing. 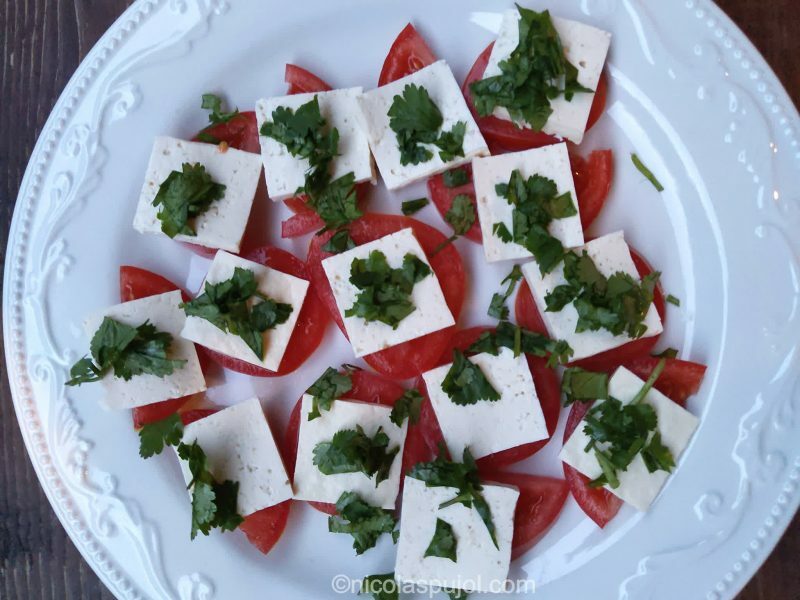 Place the tomato slices on a large plate, cut tofu slices about the same size, add herbs and top with the dressing. Sprinkle pepper on top of it all, optionally.